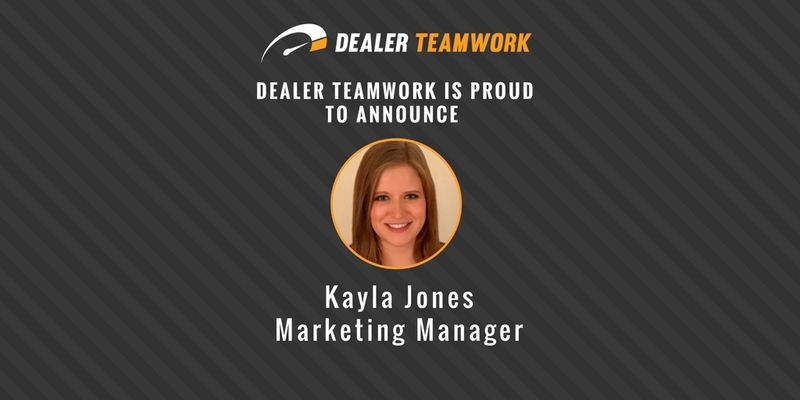 Dealer Teamwork has named Kayla Jones as the new Marketing Manager for the company. As Dealer Teamwork’s Marketing Manager, she will use her successful experiences and talents for creating winning marketing communication programs to help drive business growth and impact. Dealer Teamwork has achieved significant growth this year and continues to expand its market influence and industry offerings. With marketing experience in the automotive industry and the HVAC industry, Kayla brings a wide range of knowledge and skills to Dealer Teamwork. She will help lead the daily execution of Dealer Teamwork’s growing branding and marketing communication initiatives. During Kayla’s time as a marketing professional, she worked in marketing administration, creative execution, project management, program development and much more. She is an avid problem solver and a strategic planner. These traits plus her marketing experiences will help her excel as the Marketing Manager at Dealer Teamwork. Previously she was a marketing project manager at a third-party, automotive lead provider based out of Minnesota. Jones holds a degree in Mass Communication from the University of Wisconsin – Eau Claire. Dealer Teamwork is a SaaS company creating first-class solutions for the retail automotive industry. Dealer Teamwork created the automotive industry’s first MPOP, a patented Merchandising, Personalization, and Optimization platform. The platform creates a significant competitive advantage for dealers by distributing their transactional data to more in-market shoppers effectively and efficiently. For more information, please visit DealerTeamwork.com or visit the Dealer Teamwork FAQs.